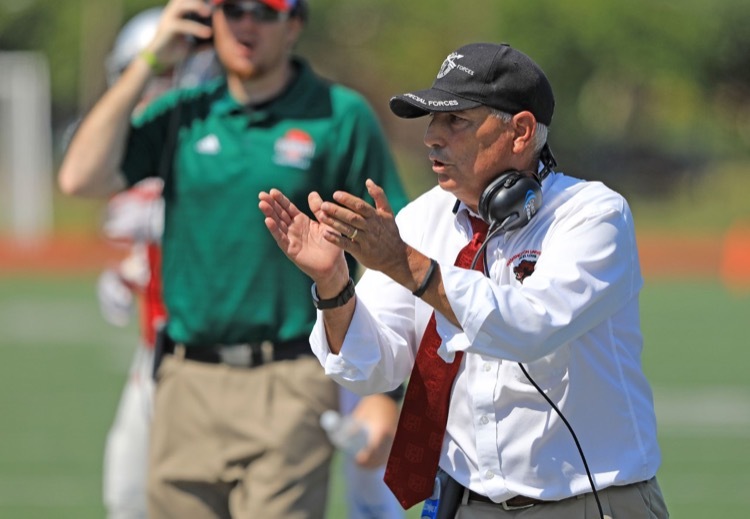 Washington University head football coach Larry Kindbom in action at a game. As I write this, it has been nearly two months since my completion of the 2017 Flatlanders 12-Hour Run in Fenton, Missouri. I had planned to write this piece sooner, but I jumped right into my play-by-play broadcasting season at Washington University in St. Louis immediately following Flatlanders. I had 13 broadcasts in September, one almost every other day. October was a little bit slower, with more road trips for the Wash-U football and the men’s and women’s soccer teams. So I used October to mull over my performance in the Flatlanders 12-Hour Run. On the surface, I was proud of my effort but a bit disappointed in the end result. My goal has not changed since my first Flatlanders sojourn: 40 miles. During prior attempts, I held back a little bit. I didn’t want to push too hard and risk an injury that would prevent me from going back to work following the Labor Day weekend, or from getting the daily agenda completed at home. But since I had a handful of Flatlanders experiences under my belt, I felt that I could push closer to the edge of the envelope this time, without suffering a figurative paper cut. And so I went… trying to keep moving, and limiting my visits at my camp. Move, move, move… I said to myself throughout the first six hours. The day was going to be very warm, but not hot… maybe 90 degrees at most. I believed that if I could reduce the number of pit stops, keeping each one under 30 seconds (except bathroom breaks), then I could get to 40 miles in spite of the less-than-desired weekly mileage totals leading up to the race. That sounded reasonable to me. I finally heeded that directive from my boiler room and slumped into a chair at my base camp. It took 15 minutes of rest to dial down the intensity before it became all consuming. If I was going to finish the race, I would have to finish it in a more relaxed state of mind. 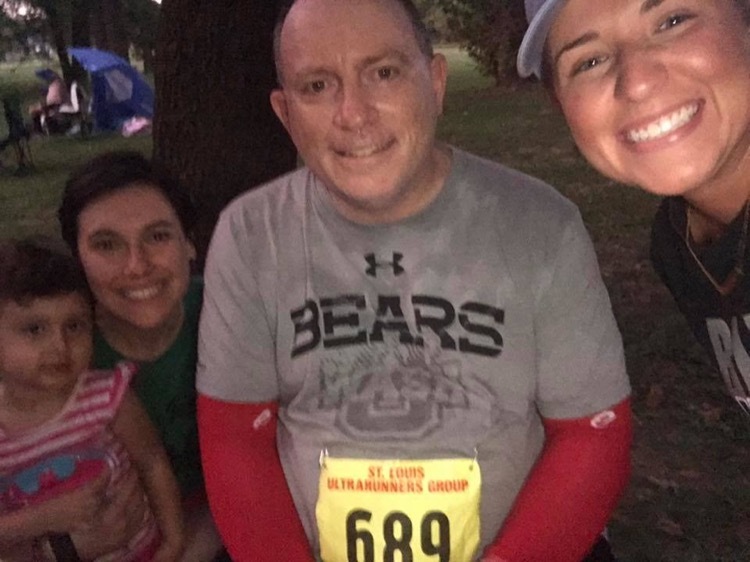 When I resumed running and walking, I had a calmer demeanor that kept me focused on when to eat and drink, and how to allocate my energy to have a strong finish and hopefully be able to reach 40 miles. The hope was dashed when it became apparent I wouldn’t be able to sustain a pace that would get me to that magical mile total. I finished well, but not well enough for my effort to be an unqualified success. I was proud that I was able to keep trudging to the final horn, but as the hours and days passed after the Flatlanders 12, I became increasingly convinced that I had failed. Period. End of sad story. Jay Murray at Flatlanders 12-Hour Run flanked by (left to right) Jude Stockton, Megan Stockton, and Brooke Jones. Megan and Brooke are special education teachers at Fort Zumwalt West High School in O’Fallon, MO; Jay is one of the paraprofessionals who assist them in their classes. Fortunately, those days after the Flatlanders 12 featured my broadcasts of several Wash-U football games. 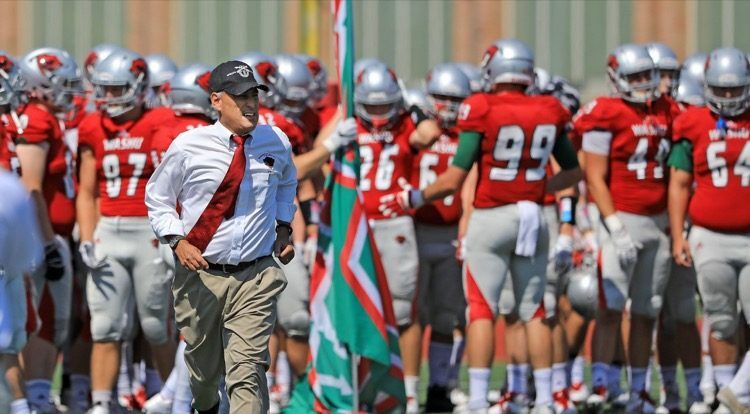 Head football coach Larry Kindbom, has (at this writing) 204 victories in his 34th season overall, and his 176 wins are tops in the history of the Wash-U football program. One of his most frequent sayings is, “The scoreboard is an imposter.” That focuses his players to look beyond the numbers on the scoreboard to determine whether the team took a step forward or backward in its development from game to game over the course of the season. For example, if you beat a team 34-0 but commit several turnovers in the process, then the scoreboard doesn’t tell everyone how sloppily you played, and the steps backward that may have been taken by the team in the process. On the flipside, if you take a lead into the fourth quarter against a six-time national champion and eventually lose the game, then the scoreboard doesn’t reflect how well you played through three quarters, and the positives that can be used as springboards to success in the next game. The lesson to be learned: the scoreboard is not a true or definitive indicator of how well or how poorly a team played in any given game. Washington University head football coach Larry Kindbom. You may be saying to yourself, “That may be true for sports that revolve around a ball or a puck, but how does it apply to running ultras? There are no scoreboards along the race courses of ultramarathons.” True. But I think we would all admit that we have scoreboards in our minds—that have our mileage or time goals posted prominently on them. And we can readily admit that we frequently determine victory or defeat, success or failure, solely on whether our final result of a race meets or exceeds the goals that we posted on our scoreboards prior to the race. If you live in an all-or-nothing world, making final determinations of a race performance based on your scoreboard is what you do. But in doing so, you may lose sight of lessons that can be learned from the race just completed, that can be used to improve your performance in the next race. What did I learn? I was able to provide answers to questions that I had after each of the previous Flatlanders efforts: Could I have given more effort? Could I save time by limiting pit stops? And, did I put in enough miles in training to reach my goal? My effort was much better—I left nearly everything out on the Fenton City Park bike path at the end of the race. I did save a lot more time by keeping the pit stops fewer and quicker. Thus, those factors could be ruled out as the reason or reasons why I didn’t reach 40 miles. The final question left unanswered is whether I put in enough training miles to reach my Flatlanders goal of 40. Upon further review, the answer is no. My training schedule was too compressed due to starting it too late, so I didn’t allot enough time to effectively build enough mileage to see me through to 40 miles. I also had a very painful three-month bout with hemorrhoids that prevented me from training on some days. Those are things that I can fix by starting a maintenance program sooner (which I have done), and having the worst hemorrhoids removed during a colonoscopy greatly improved that situation. Would I have been able to find those answers if I had just looked at my scoreboard and accepted what it told me? Probably not…I instead would be stewing in my own deep disappointment, and failing to realize that a) I did some good things to give myself a chance to reach my goal, and b) there are a couple of things that I can fix for my next ultra. So, our running scoreboards are imposters too. Especially if we accept the numbers on them at face value, without applying a more detailed analysis to extract valuable lessons from the race. Thanks to Coach Kindbom for providing that lesson to his Wash-U football players, and unexpectedly providing it to ultramarathon runners like myself. I enjoyed reading your write up and a lot of it resonates with me as I too was in the said race! I too had my preferred goal which I stated to a fellow runner (Greg) at the start. I too had things going well until the temperatures climbed and I developed the worst cramping I’ve ever had in any race and was sidelined to a howling mess on a bench along the trail for 2 hours before I was able to start hobbling again (RD had recommended stopping completely at that point). I too am glad I continued after the forced interruption until the final horn…..but I too am disappointed I didn’t meet my stated goal. Unfulfilled yes, failure not at all. Will be back another day!! PS:Still trying to find the volunteers who saved my race (maybe my life) by helping me through the cramps. I think one of the is Jill or so! !